As a reminder, we DO have school on Monday April 22, 2019 as a result of snow days. Can't wait to see all of Blazer Nation on Monday! JV Tennis dual vs St. James that was to take place today has been rescheduled to 4-16-19 due to a scheduling conflict at St James. C-team baseball double header scheduled to be played away today at Shawnee Mission North, is now a home game and will now be played at GEHS. Start time has also changed to 4:15 PM. The JV games will now be played on the varsity field and the c-team games on the JV field. All outside games scheduled for today have been cancelled. Make up dates will be posted as soon they become available. C-team soccer scheduled for tomorrow, Mar 27 has been cancelled. JV And Varsity Soccer originally scheduled for Thursday, March 28 has now been changed to tomorrow, March 27. These games will now be played at CBAC (originally scheduled for ODAC) Depart time and game times remain the same. Reminder: This Wednesday, March 27, is an early dismissal date at 2:20 for teacher collaboration. We will NOT have Seminar on this date. Blazer boys basketball ends it’s season at Washburn Rural tonight falling 30-55. The Lady Blazers season comes to an end tonight at Topeka HS falling 33-56 to the Trojans. 1st round girls action is tonight at Topeka HS. Start time is 7pm. Boys basketball sub-State championship is Friday at Washburn Rural HS (Topeka). Start time is 7pm. Boys win!!! 71-65 over Wichita East and advance to the sub-State final on Friday night. WHITE day on Thursday and Blue on Friday. We will change next Thursday (March 7) to a Blue day as well. School has been cancelled today due to ice. Good Luck to the GEHS State Wrestling Qualifiers as they head to State in Park City. Wrestling begins at 10am Friday and 9am Saturday. Come cheer your Blazers on! 1st round sub-State basketball: Girls at Topeka HS on Thursday, February 28. Start time is 7pm. 1st round sub-State basketball: Boys at Wichita East on Wednesday, February 27. Game time is 6pm. The state has designated April 2 as the make up date for the ACT test that was scheduled for today. The band concert scheduled for tonight has been moved to March 20. School has been cancelled for Wednesday, February 20. Boys get a big win and the girls come up short in the final home games of the year vs. SME. 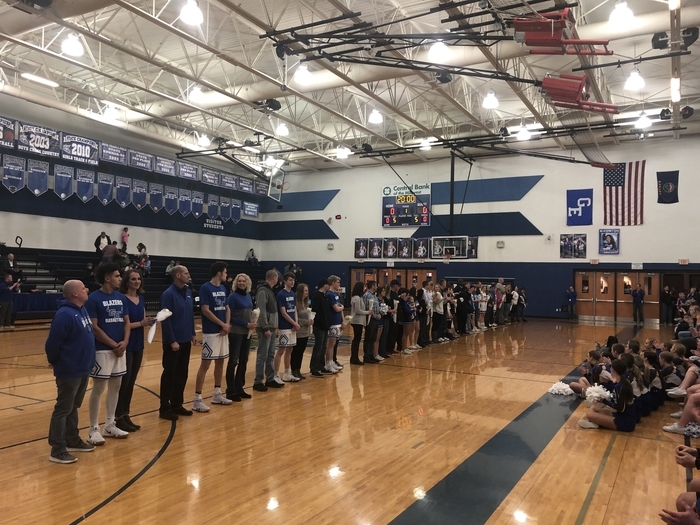 Senior night for basketball, cheer and dance! ATTENTION: all basketball games scheduled for Monday and Tuesday have been flipped. Varsity/JV etc. are now Monday and the Freshmen etc. games are on Tuesday. All basketball games originally scheduled for Friday at Olathe West have been moved to Thursday by the Olathe school district. Same start times. This is in an effort to avoid the potential snow storm on Friday night. Good luck to the Blazer wrestlers at the Sunflower League tournament tomorrow! Big wins tonight for both Boys and Girls (JV and Varsity) over SMN! The Winter Royalty dance start and end times have been changed for Saturday night. We will begin at 8pm and conclude at 10pm. Please adjust your schedules accordingly. All activities scheduled for Friday night are on as scheduled. The Winter Royalty coronation will occur at halftime of the boys game. The status of Friday games and activities is on hold. Updates will be sent when available. USD 231 custodial and maintenance crews worked tirelessly but were unable to clear the lots and walks from the ice. There will be no school on Friday, February 8. School has been canceled for Thursday, February 7. All school activities for today have been cancelled. Practices, games, meetings etc. School will dismiss at regular time. The early release day for teacher collaboration for Wednesday, Feb. 6th, has been cancelled and we will go ahead with the original scheduled date of Feb. 20th. Varsity basketball teams split their home doubleheader vs Olathe South. Boys with the league win and the Girls fall to the Lady Falcons. Students: Please wear your new #Zero Reasons Why shirt to school and the home basketball game next Tuesday, February 5. No school tomorrow. All scheduled activities will take place, including the 8th grade enrollment information night. Practices can begin at noon. Wednesday is our first early release day for teacher collaboration. The high school will dismiss at 2:20. Enjoy the extra 40 minutes in your day tomorrow! 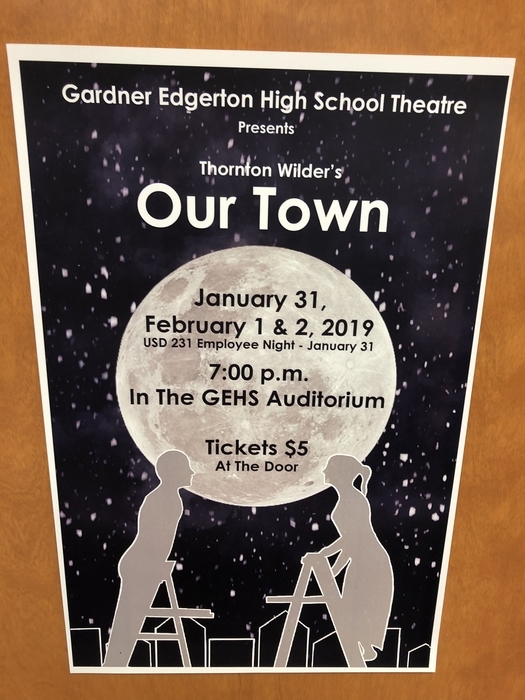 It is show week for the GEHS Theatre Department! Come join us for an evening of entertainment. 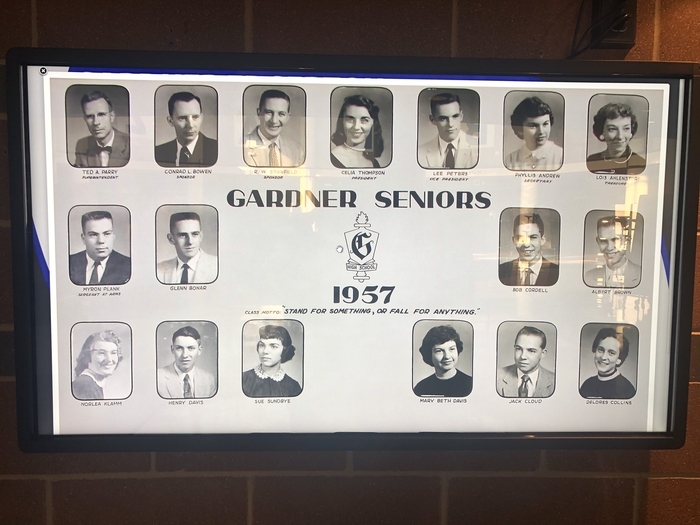 Check out our new touchscreen monitor that will display the class composites and academic hall of fame! The early release day for teacher collaboration has been moved to next Wednesday, January 30. Dismissal is at 2:20. Thursday’s schedule is now WHITE. Friday will be a COMBO day. 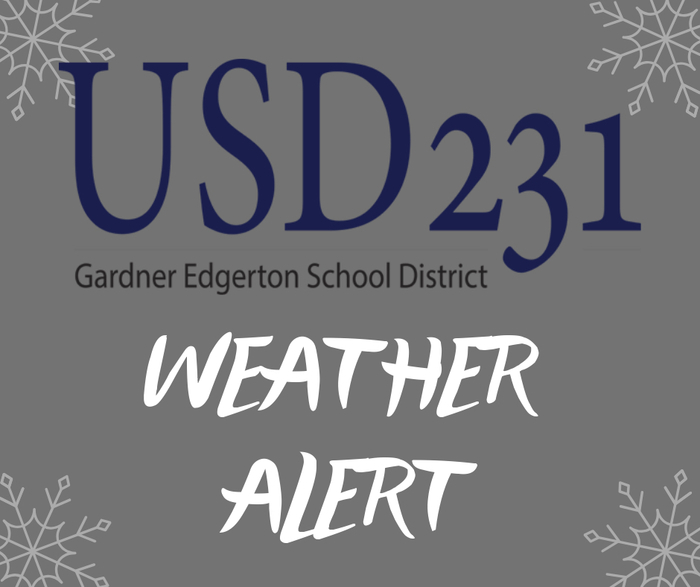 Gardner Edgerton School District and all district buildings will be closed on Wednesday, January 23 due to inclement weather. Stay safe. No school on Wednesday in Gardner Edgerton USD 231. All GEHS competitions after school have been cancelled for tonight both home and away. Practices may still occur with events ending by 6pm. Adjustments have been made today due to inclement weather. Bowling cancelled. Scholars Bowl cancelled. Boys Freshman A, Boys Freshman B, Boys Sophomore and Boys JV basketball games cancelled. Girls Sophomore C team cancelled. All wrestling competitions for this weekend have been cancelled due to weather concerns. JV Wrestling for Friday at Holton and Varsity Wrestling on Saturday has been cancelled. Wednesday, January 23, is our 1st early release day for Teacher Collaboration. GEHS students will be dismissed at 2:20. Trailblazer wrestling hosted ONW tonight and came away victorious on Senior Night! Final score of the dual: GE 42. ONW 36. The Lady Blazer basketball games originally scheduled at Lawrence Free State for Friday have been moved up a day in an attempt to avoid inclement weather. Start times and location remain the same but the new day is Thursday, January 17. Blazer fans, come out and help us pack the house with Wednesday night as we say goodbye to our seniors and take on Olathe Northwest in our only Home WreslingDual of the year. JV at 5:30, Varsity at 6:15. 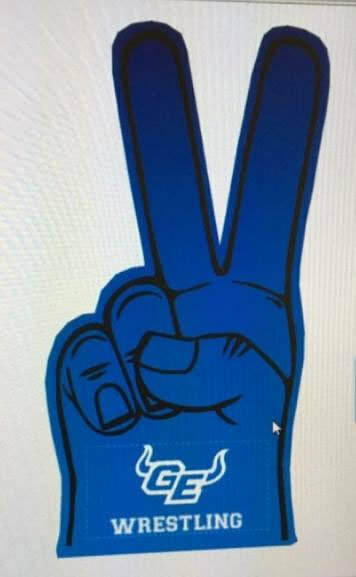 The 1st 100 GE fans will receive a "Takedown 2" GE Wrestling Foam Finger. Free ACT prep sessions for those taking the test on February 20. Sign up with the counseling secretary by January 28. Sessions are on Feb 2 & 7 and are intended for those that have never taken the course. Basketball teams were in early action tonight at Olathe East. Girls were defeated and boys fell in Overtime. Adjustments have been made to today’s basketball games due to the threat of inclement weather. 4:00 start for Varsity Girls and JV Boys. 5:30 start for Varsity Boys and JV Girls. C Team games are cancelled. Site is Olathe East. 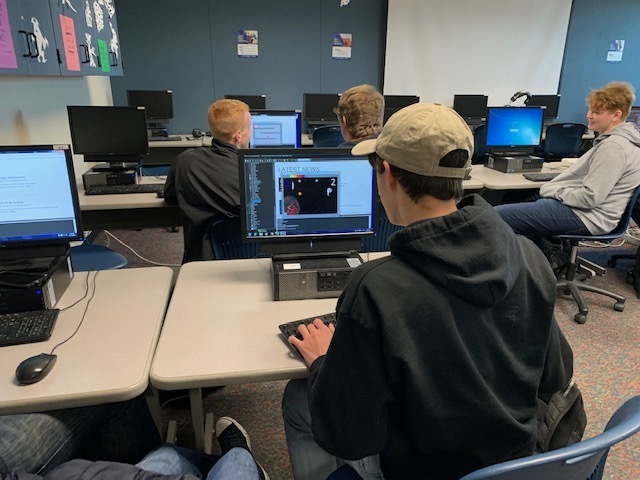 Mrs. Richey's game design students created their own video games first semester. Each game has different skill levels, one to two players, and range from time limits to lives lost. They did an amazing job! The Gardner Lions Club would like you to join them for their Annual "Soup/Chili Supper & Silent Auction" Saturday, Jan. 19 from 5:30-8:00pm benefiting GEHS Student Scholarships. Cost $8 in advance and $10 at the door. Children 3-10 $3, under 3 free. Senior portraits for the yearbook are due Friday, Jan. 18. Pictures submitted after this date will incur a $30 late fee. Classes do not start until Monday but the basketball teams were back in action tonight. Both varsity squads were defeated by Lawrence in home games. Welcome to the new GEHS webpage! Copyright © Gardner Edgerton School District 2019. All rights reserved.